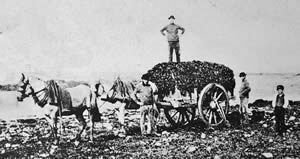 For many centuries coastal communities across the world have harvested seaweed and used it on their fields to boost their crops. In the channel islands this practise is known as ‘vraicing’ and there are still official times when it is permissible to cut and gather seaweed. Ordinarily in horticulture we apply a fertiliser that is high in Nitrogen (N), Phosphorous (P) and Potassium (K) – however, Seaweed, with values of 0(N) 0(P) and 1(K), doesn’t even come close to animal manure values. Instead seaweed contains over 70 minerals, vitamins and enzymes which address other biological needs of developing plants in some miraculous ways. Most of this gain is attributed to the presence of cytokinins in seaweed. Cytokinins  are a class of plant growth hormones (called phytohormones) that promote cell division (or cytokinesis), in plant roots and shoots. They also control root length, number and nodules, which obviously support the plant growing above them. So in essence if you feed your plants with seaweed extract, either in the soil or later as a foliar feed (sprayed onto the leaves), you’re giving them a massive growth boost. So how do you use seaweed if you don’t live near the sea? 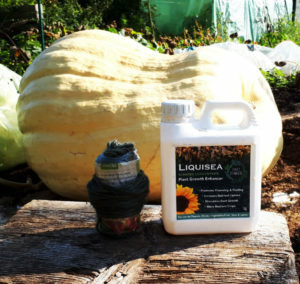 Probably the simplest way to start using seaweed on your own plants at home or on the allotment is with a liquid product such as LIQUISEA from Dorset Seaweeds. LIQUISEA contains all the growth hormones and beneficial compounds that plants need and is best used alongside a traditional NPK feed (such as Tomorite). You mix a small amount of the seaweed liquid into a watering can and apply to plants when watering. 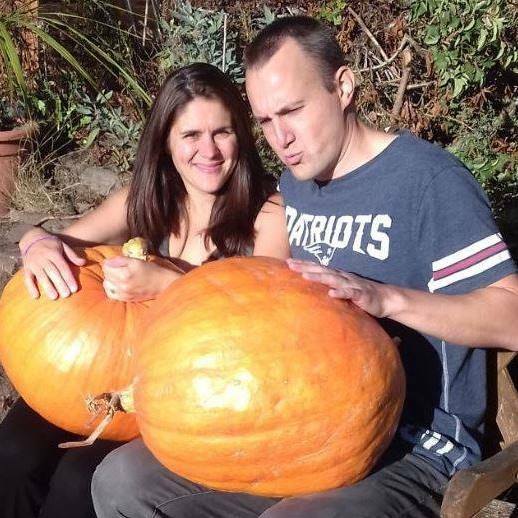 If you’re growing big feeding giant pumpkins (like I do) then a weekly feed is best, it doesn’t need to alternate with the traditional NPK feed, you can combine in the same watering can if necessary. I also found it helpful do an additional fortnightly foliar feed of LIQUISEA using a pressure sprayer to apply to all leaves where the ingredients can be absorbed. (Lidl usually have a good deal on sprayers). In addition to liquid seaweed products, I also collect seaweed at the beach if I happen to be there (note beach-washed seaweed, I don’t go cutting it from rocks which would NOT be environmentally friendly). MrsGrow isn’t a massive fan because it can mean a smelly car journey back home again no matter how many carrier bags I wrap the seaweed up in! Once home I soak it for 24 hours in tap water to remove salt, then it goes into my greenhouse, spread all over the floor to dry out. Once dry (which can take a while especially in winter) I break it small pieces and crush it by foot. Then I either add it to my main compost heap of manure for a general compost boost, or I mix it with compost as I plant out seedlings (again especially pumpkins). In summary seaweed is a must have for those in horticulture – be sure to try it yourself. It may very well give you the edge in your local flower show or simply boost the size, taste and quantity of the vegetables you take home from your allotment. How do plants respond to cytokinins and what is their importance? I must collect more and add it to my compost heaps, I’ve attempted to make my own liquid feed from it and I am not convinced I was successful! As an aside, Wilko also do their own label Seaweed feed. I use this routinely when potting on, if I think something needs a pick up before fruit has begun to set and also as a spray over foliage.